Going on a holiday, working late, or just need some help caring for your pooch? Find the perfect dog sitter on Pawshake today. Pawshake has thousands of trusted and fully verified dog sitters who offer their personalised services straight to you. Pawshake knows your furry friend deserves the very best dog minding:our dog sitters are highly experienced and simply love what they do, so you can relax knowing Fido will receive the highest standard of dog care. What is the best dog sitting service for my pooch? Some dogs find travel stressful and prefer in-home dog care or drop in visits. In-home dog care also helps to avoid coughs and other illnesses that can spread in busy kennel facilities. Many dogs love the company of other dogs, while others are shy and prefer to stay alone with a dog sitter. You can choose whether you want your pet to stay with other furry friends or not. If you require puppy sitting, or need senior dog care, a dog sitter can come to your place for personalised in-home dog care. Alternatively, your dog can enjoy a fun holiday from home in a warm family environment while you are renovating or moving house. Your best friend will never be lonely again! Why is Pawshake dog sitting a better choice? Get to know your dog minder with an obligation-free meet & greet - you’ll know you’ve found the right person for the job! Book their dog minding services securely via Pawshake for premium pet insurance, 24/7 online support and our satisfaction guarantee. Every dog and puppy is unique and special. On Pawshake, you can find a perfect dog minder for your individual dog minding needs. You won’t be out of pocket for personal dog minding: Pawshake rates are affordable and set by our dog minders. It’s super simple to find your perfect dog minder and plan a meet & greet without leaving the office. Simply log onto Pawshake, enter your suburb and start browsing friendly local dog minders who would be delighted to welcome your dog into their home and heart. On Pawshake, our dog sitters are trusted and vetted locals. You can relax knowing that your dog is covered by our Premium Pet Protection insurance during the booking. 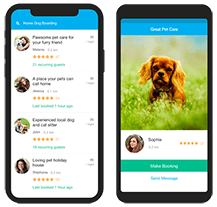 Enter your location into Pawshake to see nearby dog sitters offering in-home dog care, drop in visits and more. Use our search filters to search and find a perfect match for you. A dedicated dog minder is a great option for when your family or friends can’t help. Pawshake dog sitters happily offer their services for all pooch types, including senior dog care and puppy sitting. Many Pawshake dog sitters can perform special dog care tasks, including administering medication, puppy sitting, grooming and even pet first aid during the dog sitter job. You may miss your dog, but your dog sitter can make sure you can feel close to your furry friend with regular messages, daily pictures and updates throughout the dog sitting stay. Using dog sitting for the first time? Leaving your dog or puppy when you go away for work or on a holiday can be a little daunting the first time. With a few simple steps, you can be sure that your dog minder will do the best job possible. Read the dog minder’s profile carefully to learn about theirdog care experience and background. You can browse reviews from pastbookings and check their calendar for availabilty. If the dog sitter looks promising, send them a message. Arrange a meet and greet with the dog sitter before the booking. Get to know each other- ask questions, have a look at their home if your dog will be staying for in-home dog care and answer any questions the dog sitter may have. If your meet and greet goes well, book through Pawshake. This will activate our premium pet insurance for the booking period, the Pawshake guarantee and the support of the customer service team. Payment is processed now, and is sent to the dog sitter at the end of the booking.